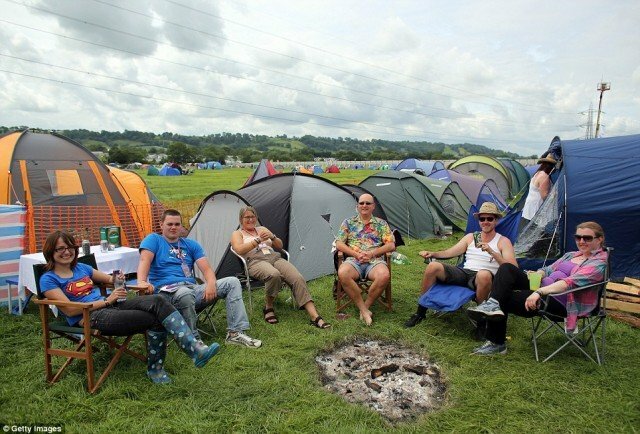 Glastonbury, the UK’s biggest music festival, is due to get under way in two days’ time, but for thousands of music fans the race to pitch their tents is now in full flow. This year’s headliners at Glastonbury are the Arctic Monkeys, The Rolling Stones and Mumford & Sons. Revelers have been hauling boxes of alcohol and camping gear as they trundle to their chosen camping spots. Police made their first arrest of the festival when suspected drugs were found inside fruit pastille sweets. Some 175,000 people will attend the festival in Somerset with an estimated 20,000 of them expected to arrive by coach or train. Earlier, former Oasis frontman, Liam Gallagher was seen arriving at Castle Cary – the nearest railway station to Pilton. Liam Gallagher is rumored to be playing a set with his band Beady Eye. Unlike previous years, the weather for the next few days is expected to remain fairly settled – although some drizzle is forecast for Friday. Glastonbury founder Michael Eavis said he believed the weather, combined with the line-up, means this year’s festival will be “unusually good”. “The whole thing is fantastic,” the 77-year-old farmer said. “There are 1,000 acres of creativity on a massive scale and to a very, very high standard. Other highlights this year will be appearances by Primal Scream, Nick Cave and the Bad Seeds, Professor Green and Dizzee Rascal. Although the Wombles will not be returning to the stage, some of the more unusual acts over the next few days include Sir Bruce Forsyth, country star Kenny Rogers and the Dalai Lama’s Tibetan Monks. Traffic has been flowing steadily along the main roads into the 900-acre festival site, at Worthy Farm, near Pilton. He added people should also consider routes other than the A361. John Holt said: “The majority of people have been using satellite navigation and coming off the M5 – we would stress that there are other routes down. The police have estimated traffic will remain busy for the rest of the day and into Thursday. Monday will also be another busy day as people make their way home. Glastonbury is returning after a one-year hiatus in the Olympic summer of 2012. During the one-year break, Michael Eavis grew wheat on the festival fields.